Suncoast Pinball announced last year that they plan to build a game called Cosmic Carnival! A few prototype whitewood pictures were released last summer. Last week, Suncoast Pinball added a new member to their team – pinball artist Dirty Donny! Dirty Donny has worked on several beautiful machines, including Metallica, Pabst Can Crusher, and Aerosmith. Aerosmith won the 2017 TWIPY Award for Best Artwork. Dirty Donny will be redoing the art for Cosmic Carnival, and has already designed a new logo – check it out! Suncoast Pinball is planning to bring two Cosmic Carnival machines to the Texas Pinball Festival in March, so go play one! TWIP: When did you decide to build Cosmic Carnival? Suncoast Pinball: Let’s start at the beginning. My love for pinball started when I was a kid. I grew up working at my family’s restaurant in Northern Indiana. At the age of 9 I started bussing tables and I was paid $.25 for every table that I cleaned. Every single quarter I got went right into the arcade and pinball machines at the restaurant. 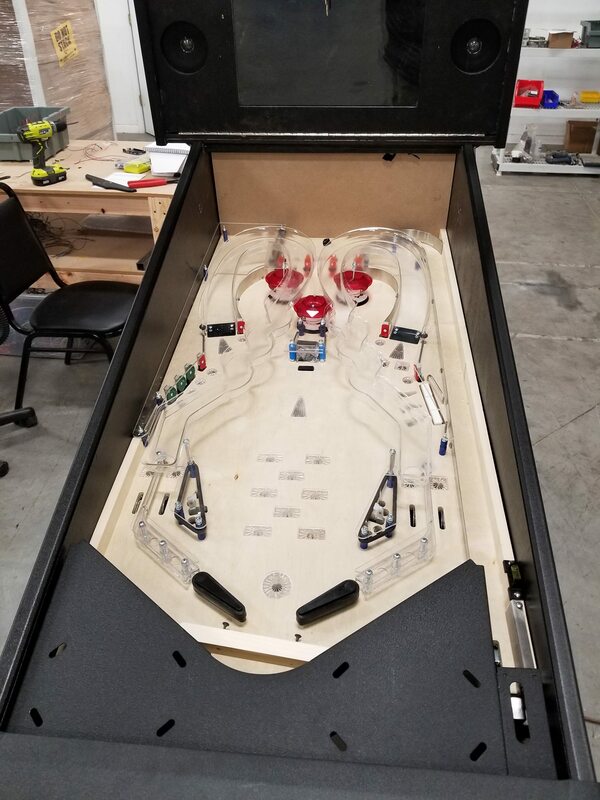 Fast forward a few decades … I have wanted to build a pinball ever since I got into manufacturing. I understood that pinball is a much more complicated animal so it wasn’t until mid-2017, when we moved into our new facility, that we actually started working on the concept for Cosmic Carnival. In late 2017 we had a basic whitewood playfield design and decided we would move forward so we started the process to expand. In early 2018 we were able to double our facility size to 12,000 sq/ft giving us room to go further with pinball. We currently have an expansion plan in place to take us to 20,000 sq/ft within the next several months. TWIP: How did you come up with the theme? Suncoast Pinball: Our in-house graphic designer/illustrator, Nate Sutherland and I were brainstorming on themes that would work well for an unlicensed/original theme. Both carnival and space are popular pinball themes, but we couldn’t think of anyone who has put them together, so we married the two and Cosmic Carnival was born. TWIP: How long has it been in development? 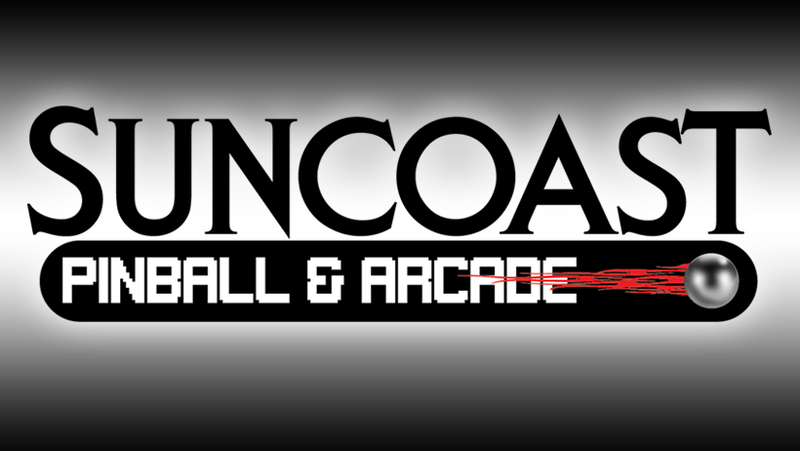 Suncoast Pinball: It has been a little over 1 ½ years since the very beginning. We brought in a software engineer about 6-7 months ago and an electrical engineer about 4 months ago. TWIP: How difficult has it been to build the prototype machines? Suncoast Pinball: The actual build for prototype machines has not been a big deal, since we already have a manufacturing facility in place. We already had 2 4’x 8’ CNC machines, an industrial table saw, routing tables, sanding tables, drill presses etc. Almost all the tools needed to build a pinball machine were already in place, along with the staff capable of building them. One area we had no experience in however was vacuum forming. We did buy a vacuum forming machine so we could prototype our own ramps in-house and we learned how to do it as we were going. It turned out to be a great investment. We can change the design as needed and have a brand new, formed ramp done in less than a day. It allows us to make changes for prototyping so much quicker. It is also a lot nicer to be able to test it quickly with the material that will be used in final production. Our biggest challenges have been with the design. Designing a playfield where all the components fit up top and underneath took a bit of time. Especially when you have to make it fun, make the shots work with no conflicts or ball traps. It has been challenging but also a lot of fun. The design and overcoming the challenges is something I really enjoy. TWIP: Do you plan to have the new Dirty Donny artwork on the machines by the Texas Pinball Festival? Suncoast Pinball: We do! When we first talked to Donny that is one of the boxes that needed to be checked, the deadline for Texas. He was very confident that he would have everything to us in the timeline we gave him so we could have 2 machines ready for TPF. There may be some minor changes or tweaks we will do after TPF, but we have every confidence in Donny that what we bring to TPF will be very close to what will come off our production line and that it will be a great looking pinball machine! TWIP: Do you plan to manufacture these machines in-house? Suncoast Pinball: Yes we do. We have already started setting up our production lines in anticipation. We have the capabilities to build the cabinets, the playfields, the ramps, the plastics, the toys and to print all the graphics in house. The playfields will be cut, sanded and populated with the inserts in-house. Then printed and coated off site and brought back to be populated. We have a bit of an advantage already having the manufacturing infrastructure in place. TWIP: Do you have any idea on how many you plan to build? Suncoast Pinball: We will build as many as are ordered. We estimate initially we will be able to manufacture about 10 machines per week and we will have the space and ability to ramp that up to 50 per week, over time, if there is enough demand. TWIP: Do you know what the cost will be? Suncoast Pinball: Our initial cost analysis puts the price point for this machine at $5,500. Now that number can change up or down slightly based on all the final numbers. While we have a lot of the machine designed there still are a few components we are working on so it is impossible to have a final price at this point. TWIP: Will you be taking pre-order money to fund the build? Suncoast Pinball: We will not take any deposits for Cosmic Carnival. We are pretty close, right now, to be able to manufacture Cosmic Carnival but we are not close enough to accept any orders. Anyone who is interested will be able to sign up for more information and can go on a pre-order list. Those will be some of the first people we open sales up to. Once we are ready to start manufacturing, we will open up our ordering platform. TWIP: Do you know when manufacturing is expected to start? Suncoast Pinball: Our goal is to start full production by the end of May. We can start manufacturing some parts and components earlier, for example our cabinets, playfields, ramps and wire harnesses. For those items we hope to start manufacturing as soon as March. Feedback, comments, thoughts? Email thisweekinpinball@gmail.com. Previous Previous post: The TWIPYs – VOTE NOW – Time Running Out!